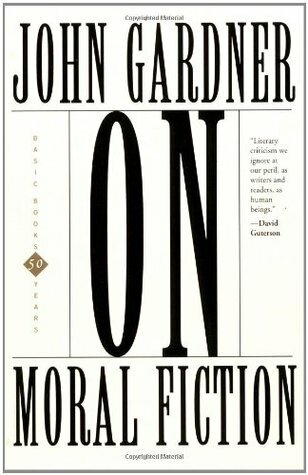 A while back, Eri ka Dreifus had recommended John Gardner’s On Moral Fiction, a slim volume dedicated to writing and literary criticism from the POV that an artist has a moral responsibility to their audience, and that art criticism should in part address how well the creator of a work of art has met that responsibility. The book dates from 1978, and it’s amazing how well it (thus far in my reading) stands up over time. I’m only about three chapters in, and what strikes me most is how similar Gardner’s stance is to that of Rabbi Michel Twerski, the Milwaukee Rebbe. In an interview a few years back, Rav Twerski defined art as a creative process devoted to building people and society, in which there might be some destruction, but only if that destruction is necessary to the ultimate positive end of the project. This is pretty much Gardner’s position. If we’re talking fiction, my primary goal is usually none of those things. and your spouse (and your best friend and your mom and all your siblings) are not picking up their phones. I guess what I’m saying is that my initial goal while writing fiction isn’t really the message or the entertainment or the inspiration (even though once I’m revising, those become more important than they start out) but the desire to get whatever is in my head into other people’s heads. It’s a desire to communicate. I got some emails after that which pretty much endorsed my approach, but a couple of colleagues seemed concerned that my attention to messages and so on came only after my goal to tell a story from my heart. Gardner insists that the world doesn’t need simple, cliche morality. People will rebel, he says, if we present obvious, heavy-handed, judgemental, 2-dimensional messages in the guise of literature. Here’s what he proposes “instead of teaching by authority and force, it explores, open-mindedly, to learn what it should teach.” He proposes we test values like we’d test a hypothesis. It is in the revision process, says Gardner, wherein messages, psychological insists, and so on become clear. How do you define “moral art?” At what point in your creative process do you contemplate your work’s morality, if at all? The interplay between the creative impulse and the moral impulse when producing art can be a complicated question. There’s no one “right” approach, as I see it. When you have an idea and are bursting to put it into words, your mind is providing you with the next vehicle on which you may choose to deliver your next moral message. Every person’s mind operates differently and creates art differently. Whether the creative idea is the driver or the moral message is the driver, one can produce great stories. One more comment. Moral art uses the aesthetic to present a moral idea in a relatable way. A mom at our children’s school is a very talented painter. She has decorated much of her home with captivating pictures, and nearly all of them include p’ssukim from Tanach or portray something Biblical in a beautiful way. I often find myself thinking about the message that I want to convey and the story at the same time, so it’s hard to say which comes first. I don’t have a consistent answer yet. Like in your Neal Shusterman example, I don’t think you need a consistent answer to the question. Sometimes ideas come in different ways. I know the ways I germinate ideas for stories I was assigned to do vs. that I wrote without previous assignment are very different. Yes, and that’s one of the beauties of writing. A story concept, a moral idea, or just an interesting thought can serve as the spark that ignites something truly wonderful. When I was writing fiction, I tended to have an idea of a moral, although I can’t remember at what point in the creative process it came. I think I tended to write fairly didactic stuff, which was why I gave it up for poetry (I eventually gave the poetry up for silence when I lost confidence in that too). I think art shouldn’t be too overtly moralistic. Having a strong moral message is one thing, but no one likes being preached at and art is often at its best when ambiguous and open to interpretation and multiple viewpoints. I can’t really think of many successful writers who have been very moralistic. I guess Dickens might be one. This might be problematic in the religious world (not just among Orthodox Jews, but fundamentalist Christians and for all I know other religions), which tends to react strongly against any portrayal of alternative viewpoints or ethical systems – even negative portrayals can be considered problematic, let alone more ambiguous ones. I agree that when the reader feels they are being knocked over the head with the message, there is a level of annoyance which interferes with absorbing the message. There’s also a certain arrogance that can be inadvertently conveyed in stories like that. I think that’s why the approach described by Gardner (the one I explained at the end of the post) appeals to me more. Sometimes, you don’t really know what you believe or what the message is until after you’ve finished writing the story and revising it, and the process of writing can be one where the writer sorts out their thoughts. I’ve also had some experiences with creative writing – though probably more with personal essays than with fiction – in which that has proven very, very true. To me, the best approach is to rely heavily on “show, don’t tell.” As the reader observes the characters’ actions, they can come to their own conclusions about the characters’ morality. On the other hand, I think in certain contexts, and author is given a bit of leeway. For example, teachers, philosophers, and spiritual leaders (not exclusively Jewish ones) rely heavily on fables. The only reason the story may exist is to demonstrate a point. In some cases, they may even be thought experiments. In a case like that, the audience anticipates the didactic nature of the story, and they don’t resent it. So maybe setting and expectation play a larger role here than we’re giving credit to. And regarding your own writing: so long as you save it, it’s never gone. So if you aren’t ready to share, don’t worry about it. But sharing and accepting both the criticism AND the complements will help your writing grow. Have you ever read a book by or watched a video by Brene Brown? She talks about coping with fear and taking risks and so on. Super- good stuff. Even if you aren’t going to be able to act on it right away, it might be good for you to read/watch. Sometimes, you don’t really know what you believe or what the message is until after you’ve finished writing the story and revising it, and the process of writing can be one where the writer sorts out their thoughts. I saw Amos Oz (I think) say somewhere that when he writes fiction he tends to be exploring what he thinks about an issue; if it’s something he already feels strongly about, he’ll write a non-fiction article about it. But sharing and accepting both the criticism AND the complements will help your writing grow. I know. The problem is that criticism just fuels my self-loathing and lack of confidence in my writing and makes me want to stop. Positive feedback doesn’t really boost my confidence, though, and sad to say I got very little of it anyway. With my poetry, I could hardly convince anyone to even read it! The funny thing is, I feel my old writing is gone, even though I religiously keep at least two copies of everything (hard drive, USB, sometimes posted private on my blog too). I’ve been thinking lately of some posts I wrote ages ago in what I call Hevria-style (this was before Hevria allowed guest posts; I wanted to be a regular writer and was trying to build a portfolio of work to prove my worth) and it’s really hard to summon up the courage to submit it. Partly it’s fear of rejection again, but partly it’s that old writing doesn’t feel like a part of me any more, even if it’s only from a year ago. I would feel awkward putting it out there and letting people comment on it and expecting myself to reply because I usually can’t even remember what was going through my head when I wrote it! It’s like someone else wrote it. It’s a pity, because even with my hatred of my own work, I can see there are a couple of pieces that might be worth sharing. There’s an essay on mysticism from a couple of years ago that I think was quite interesting and unusual and a short story/fable I wrote about eighteen months ago, trying (and failing) to work through some issues about control. There’s some poetry that I’d like to revise too, but I just can’t face going back to it. I’m very bad about revising; wrong of me I know. Funny that you mention Brene Brown. One of my favourite Jewish bloggers, Princess Lea of The Frumanista blog, is very into her and recommended her to me, but I haven’t followed it up yet except to watch one video online. I probably should, especially as I’m trying to read more non-fiction. Maybe take just that one piece on mysticism and work on that one. But I totally know how you feel about looking back at past work and feeling like, “I said that? I was feeling that?” It’s like it was written by someone else. Such a strange sensation. Also, you know how some speakers are better as speakers, and some are better as writers? I think Brene Brown is great at both. When you read her, she makes difficult topics funny, and it helps the message sink in. But then her on-stage persona is so folksy and self-deprecating (and very American, which I have no idea how you feel about it) that I just love her. I’m currently working on a piece on loneliness, which (unfortunately) is where I am right now. I hope to get that finished soon and submit it before I have second thoughts. I’m not sure what to do with the mysticism piece, as it was very much of a particular time: it was written in response to hearing someone give a talk on the history of Jewish mysticism and made me rethink my prejudices about the topic, but that was a couple of years ago now. Unusually for me, it starts with describing the events that triggered my thoughts and I’m not sure how to rewrite it from the point of view of years later. I have no problem with Americans! I’ve always had American friends, actually. And it’s pretty much impossible to avoid American culture here. I don’t read the beauty product posts on The Frumanista either, but there’s a lot more there that interests me.